Well the Christmas season is truly upon us, we have even had snow to get us into the festive spirit! Christmas is a time for getting together with friends and family – hopefully ones that you like! Christmas parties and lots of food and drink of running around shopping, cooking and preparing to travel. As an Osteopath I thought it would be a good idea to advise you on the importance to take the time to care for yourself and avoid unnecessary injuries during the run up to and over the Christmas period. Try to stagger the shopping by shopping in stages! Carrying too many shopping bags will put strain on the muscles and joints. I know it is not cool but using a shopping bag on wheels with lessen the load on your body or try using a rucksack to carry your presents in. You can often find your local Osteopath, yes me, sporting my wheelie shopping bag around Bedford town – I should have one with the logo ‘I love my Back’ written on the front! When food shopping, use the smaller trolley as they are not as deep so will make the process of loading and unloading easier, as you don’t have to bend down so far to retrieve your items. Trying to lift a heavy frozen Turkey or crates of drinks out from the bottom of large trolley is asking for back trouble! Also don’t be afraid to ask for assistance. Wear comfortable supportive shoes when shopping. Tottering around in high heels whilst carrying loads of bags for hours will not do your back any good. Avoid icy patches – The weather is getting colder and with that brings ice. Wear sensible shoes when you’re out in icy weather to avoid slipping and causing an injury to your back. You can always change your shoes when you arrive at your destination. 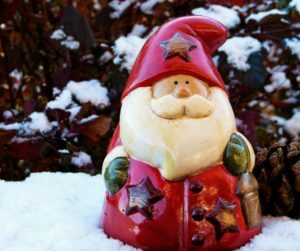 If we are fortunate to have a white Christmas (a little trivia for you – the last white Christmas reported in Bedfordshire was in 2010!) be careful when shovelling the snow. Allow for plenty of time to clear your driveway or area. Make sure the shovel is at the right height so your back remains straight. Push the snow instead of throwing it to the side, this will put less strain through your shoulders and spine. Be mindful of your posture when wrapping presents and writing cards. We all done the sitting on the floor or the bed scenario and regretted it afterwards. Sit at the dining table to wrap your presents and to write your cards. Remember to take frequent breaks as sitting for long periods puts a lot of strain on you neck and back. Have help when putting up decoration and sorting out the tree. Wires and ladders are a common hazard in the home. If you are getting the decorations from the loft, try not to lift down heavy boxes. Its far easier to strain your muscles and joints bringing down boxes especially when on you are unstable up a ladder. Have someone there supporting the ladder and to receive the boxes or decoration at the bottom to avoid over stretching and awkward positions. Cooking the Christmas dinner can be extremely stressful, making sure you get all the timings right, everything fitting in the oven. If you are having turkey this year be mindful how you lift it in and out of the oven especially if you have a low-level oven. Make sure you get help lifting it in and out, not only don’t you wont to injury you back on Christmas day, but you don’t want the turkey ending up on the kitchen floor, you get scolded with hot fat and the dog running off with the turkey leg! Finally – So from your Osteopath I wish you all a happy jolly great Christmas!